Violet had Trisomy 13. Three thirteenth chromosomes when she should have had only two. This affected her heart, her brain, her eyes, her ears, her scalp, her hands. I remember asking (fighting the urge to beg) the doctor doing one of our many scans to tell us what she would look like. "Check again, does she have a cleft lip (common in Trisomy 13 babies) or club feet? Can you tell if she has hair? Will she look like her sister?" There is only so much you can tell, even from a 3D ultrasound. What I really wanted to ask was, "How will I love this baby who looks so different?" I felt like advance warning of her physical appearance might better prepare me to be her mother. 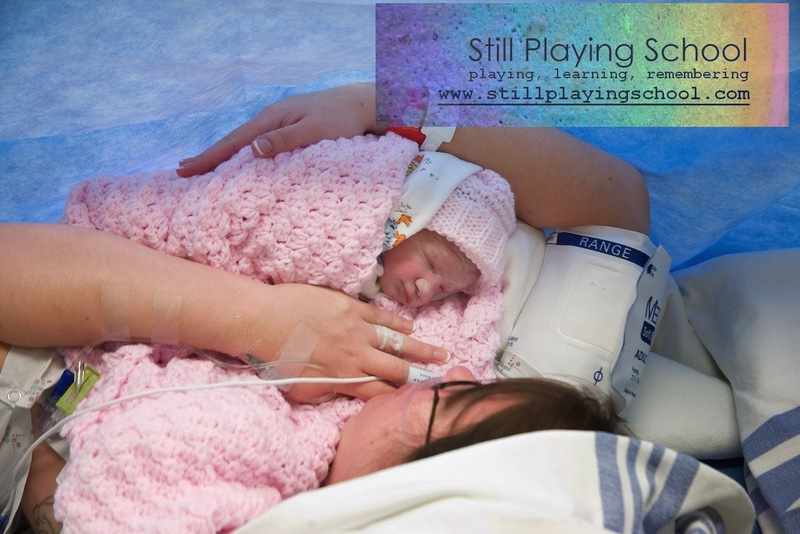 I poured over pictures of other babies with Trisomy 13 online. There is such a vast spectrum of physical characteristics a baby can have so I imagined her with each. A newsletter came in the mail. It was written by and for families with Trisomy babies. There were support groups and annual meetings that we never thought Violet would survive to see. Yet, in the dark kitchen one summer night when E was already asleep, my husband and I looked at each picture of those babies and children, imagining the little girl in my growing belly and wondering which of them she would look most like. Well meaning people told me that I would love her as she was because she was my baby. I heard their words and I registered what they were saying, but I just wish I would have been able to understand the solid truth to this before she was born. It would have saved me a lot of sleepless nights and unnecessary worry. And then she arrived. I'll never forget laying eyes on her while the whisked her away as I was still on the operating table. Even across the room, I could see how she was different. But I could also hear her small cry. I fell in love. Last night, anticipating that today was Trisomy 13 Awareness Day, I searched the internet looking for a banner or ribbon to add to my Facebook page today. Those same children that I looked at almost two years ago came up in my results. I even know some of their names and stories now. I've connected with their families. This time, I saw Violet in each of them and I loved them, too. If you are reading this and you've had a prenatal diagnosis of Trisomy 13, but you are still preparing to meet your baby, I'll tell you what everyone told me: You WILL love your baby fiercely and passionately no matter what s/he looks like. But I'll also tell you that it doesn't matter if you don't or can't believe me yet. You can be scared and nervous, but it will all go away when you lay eyes on your sweet baby.